Friday marked the start of the 61st Annual Christmas Town USA celebration in McAdenville, North Carolina. MCADENVILLE, N.C. — Friday marked the start of the 61st Annual Christmas Town USA celebration in McAdenville, North Carolina. At the stroke of 6 p.m., McAdenville Elementary first-grader Sanaa Sade Swain flipped a switch during a lighting ceremony, turning on a glowing half a million lights along McAdenville’s Main Street. The light display will glow nightly through December 26. Hours are 5:30 p.m. to 9:30 p.m. Monday through Friday and 5:30 p.m. to 11 p.m. Saturdays and Sundays. Event organizers say the lights are set to timers and will begin and end right on schedule, regardless if there are cars still in line. 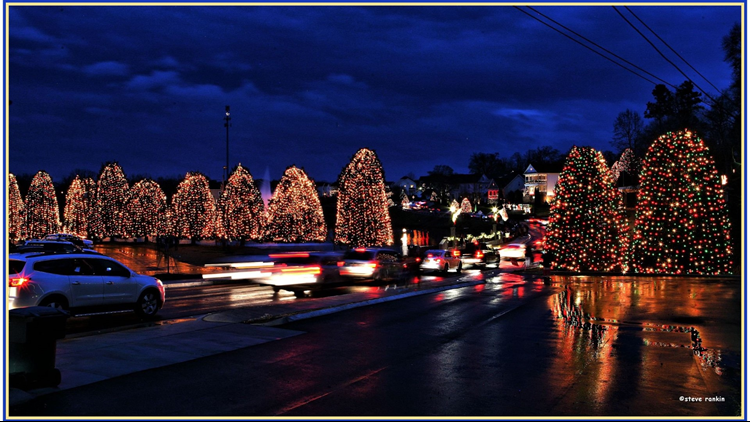 Christmas Town USA is accessible from exit 22 on Interstate 85 and also by US 29-74. NCDOT is also asking that due to the large number of vehicles expected in the area, motorists should expect delays and slow down for the remainder of the holiday season. They say one option is for visitors is to arrive early, between 5 and 5:15 p.m., find a parking spot and wait for the lights to come on at 5:30 p.m. Pedestrians are asked to remain on the sidewalks and not enter homeowners’ private property. McAdenville is just west of Charlotte off both I-85 and Route 74.